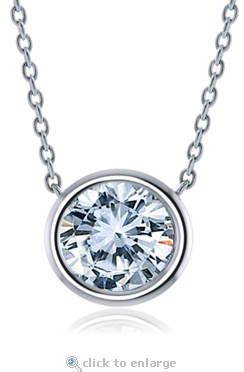 The 3 Carat Round Bezel Set Cubic Zirconia 14K White Gold Solitaire Pendant makes a wonderful addition to your jewelry collection, simple yet elegant. This gorgeous diamond look pendant can be worn on a casual day to day basis to dress up your wardrobe and it can also add that perfect touch of brilliance for a fancy evening. 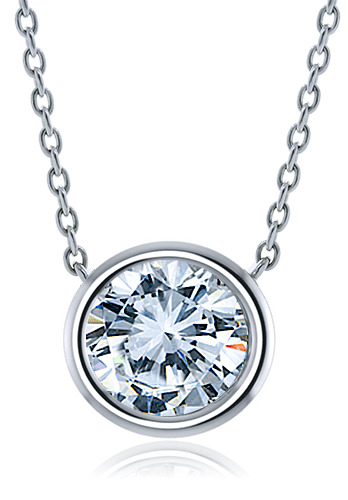 Show off your sense of style with this stunning brilliant 3 carat 9.5mm round solitaire style station type necklace that is bezel set in a tube like framed bezel mounting, encasing the entire depth of the round diamond look cubic zirconia, allowing it to lay flat against the chest and face forward. A delicate 16 inch fine rope chain is affixed and attached to each side of the bezel accentuating the beauty of the bezel setting, creating the look of a stationary floating solitaire pendant. 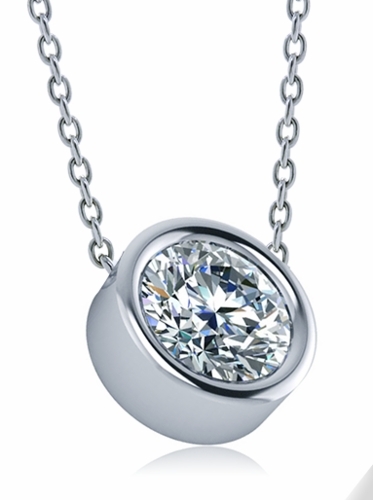 This pendant is offered in 14k white gold. For further assistance please call us directly at 1-866-942-6663, option 2 or visit us via live chat and speak with a knowledgeable representative.